Mark your calendars and stay tuned for all the details on these fun, dog-friendly events that help out animal charities! 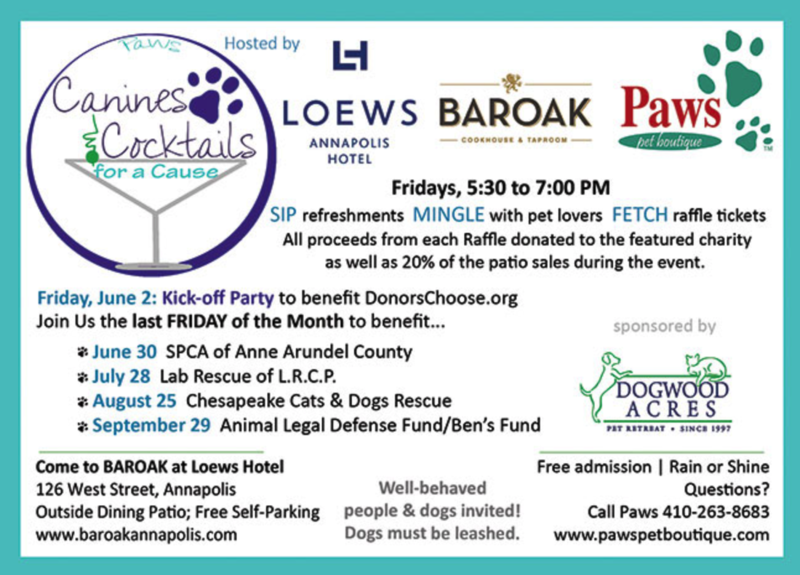 Our dog-friendly happy hour series continues with Loews Annapolis Hotel and Baroak this summer and supports well-deserving charities. We're delighted to include Dogwood Acres Pet Retreat as our sponsor this season. Free admission and free self-parking with validation at the event. Raffle prizes (don't forget to bring cash for tickets! ), Refreshments and a feel-good feeling to start your weekend! Have fun and give back...it's all good! No admisssion tickets needed, but don't forget to buy a few raffle tickets at the event to support the featured charity! Call us if you have any questions at 410-263-8683. Paws Pet Boutique is passionate about community outreach activities to make a difference. Stay in the loop with us here or follow us on Facebook, Instagram and Pinterest for our latest fun, fundraising events. Many of our events benefit Animal Legal Defense Fund. This organization rescued our beloved Jack Russell Ben. Click here to read the article in O, The Oprah Magazine about how ALDF rescued Ben and 300+ other dogs from a hoarder. Ben passed away Thanksgiving 2015. Click here to view our Tribute to Benjamin and Click here to read the article The Capital newspaper ran to celebrate Ben's life. Ben was funny and unforgettable. We are happy his spirit will continue with Ben's Memorial Fund set up by ALDF to continue to help animals like Ben. Click here to learn more.